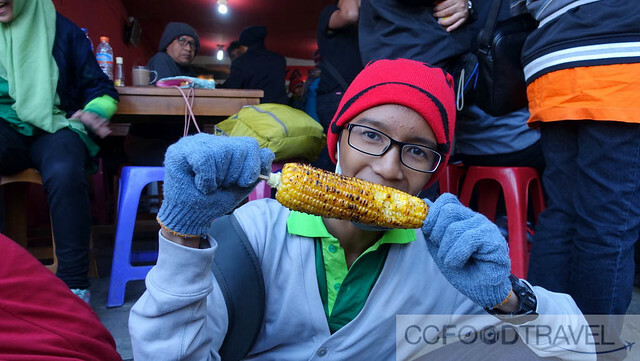 We had heard so much about Mt Bromo. Standing at 2329m, it might not be the tallest mountain in Indonesia (Puncak Jaya in Papua is), but it’s definitely one of the most captivating and alluring. 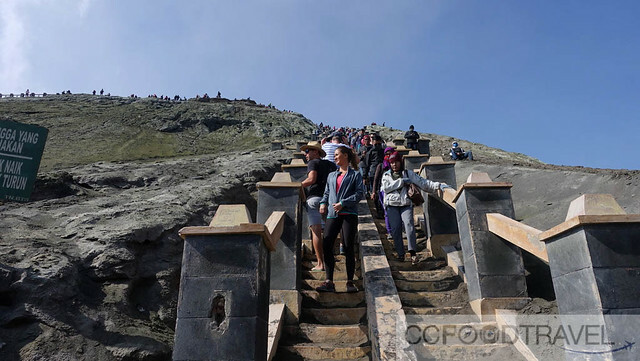 Every year, thousands of travelers and tourist hike up the mount and we were about to do the same, along with 30 others on the WonderfulIndonesia campaign. To get to Bromo, we first had to fly into Juanda International Airport at Surabaya. There are direct flights from Singapore, Kuala Lumpur, Hong Kong, Jakarta and Bali. We actually flew in via domestic from Yogyakarta, on Wings Air (roughly 2 flights per day) which cost around 700,000 IDR (RM210) per person. 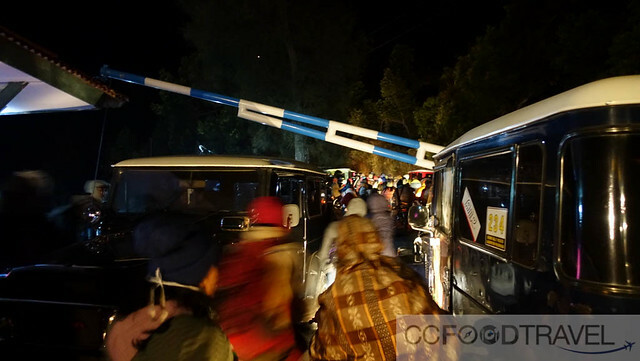 We then took a chartered bus to the town of Probolinggo which took approximately 3 hours. 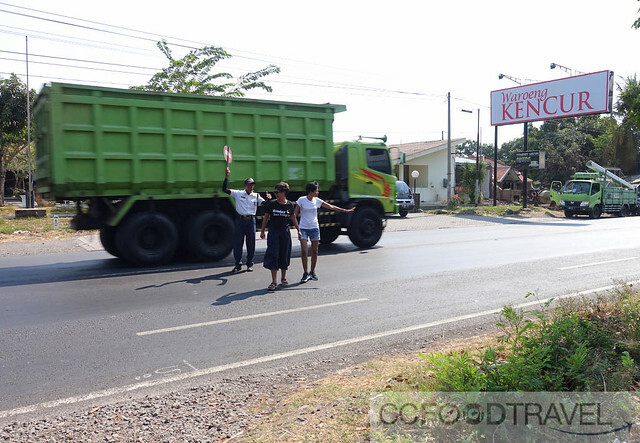 We broke for lunch and had a mere 90 minutes to explore the sleepy town of Probolinggo. 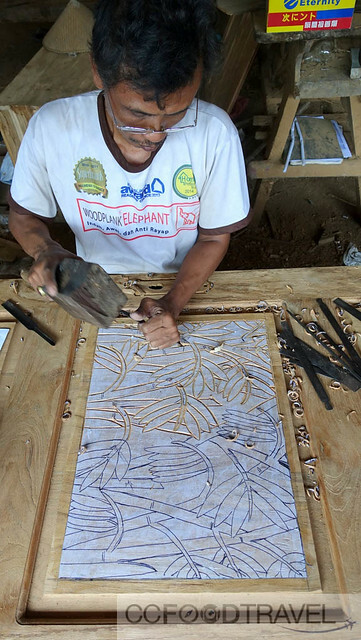 Just 500 meters across the road from Warung Kencur, and across the railway lines, was this village, whose main industry seemed to be corn-growing, teak wood carving and prawn farming. 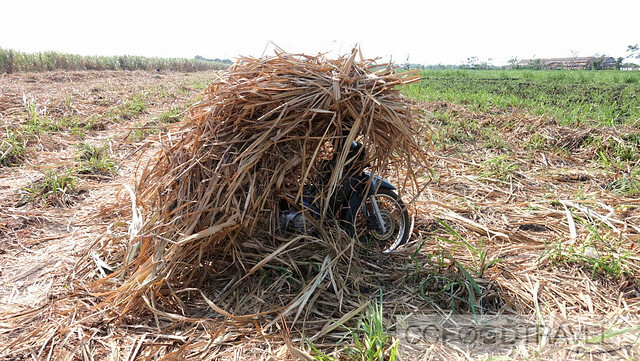 After stopping to check out the teak factory, meandering past the corn fields, a cemetary and a prawn farm, .. we found it. A lovely mangrove beach just 30 minutes by foot from town, and really, who would have guessed. And that’s why we totally agree with saying, not all who wander are lost. Not at all. 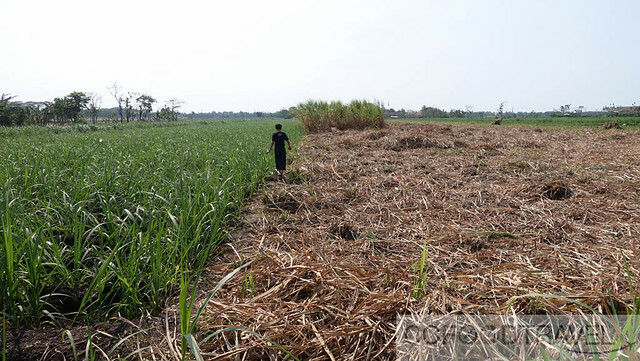 Now from Probolinggo we made our way by bus again – approximately 90 minutes to Sukapura where we changed for the shuttle bus (smaller, 9-10 seaters), for obvious reasons. We were about to begin our ascent to where our next lodging would be located. The main road soon dwindled into a 2 way lane – winding and gravel like. 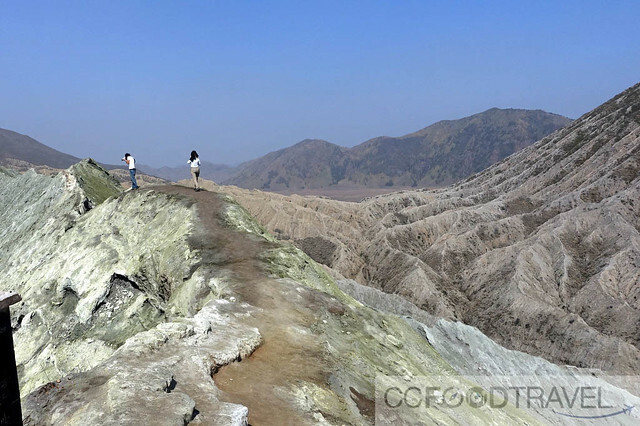 Jiwa Jawa is located in Wonotoro, Sukapura Probolinggo district, East Java and it was selected for obvious reasons – with an early start of 3am, the resort is located at a strategic spot, 2000 meters above sea level and just at the doorstep of the Bromo Tengger Semeru National park. 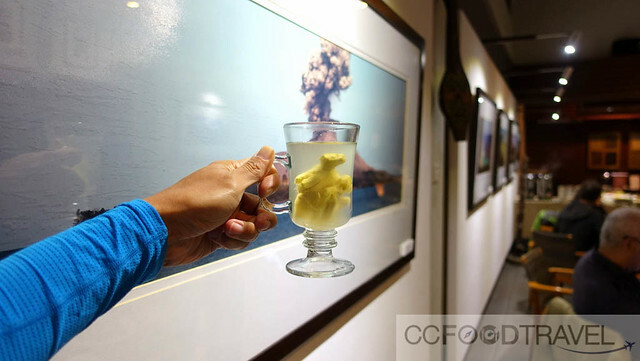 Jiwa Jawa (formerly Java Banana Bromo) would be our choice – small but modern, it was very pretty. 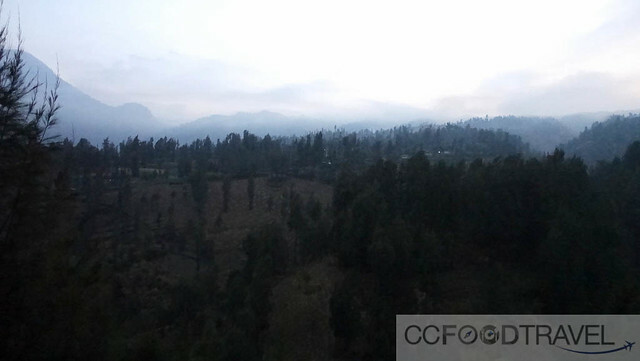 Situated on the volcanic slopes, it offered a dramatic, unobstructed panoramic view of the hills below. 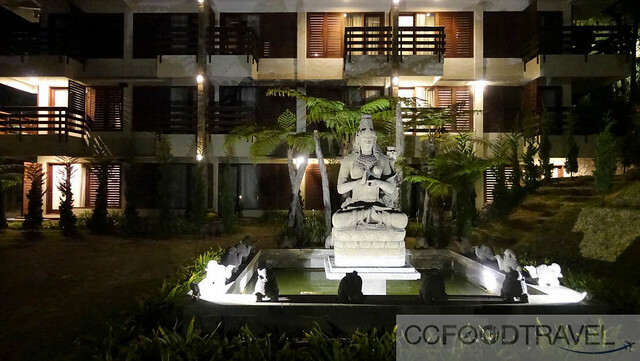 The were singles rooms and huge suite rooms to choose from. Things were functional enough, if not a little dusty. We got a massive executive suite room upgrade with a lovely view. Rooms are not heated here so definitely prepare some warm pajamas. Loved the bed.. no complaints from me! 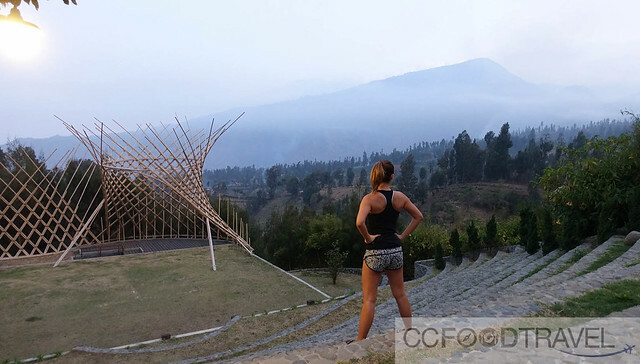 Tea and snacks in the evenings, with a lovely view..
There’s even a rather cool outdoor arena for shows at Jiwa Jawa – a gorgeous spot to practice yoga if you ask me. Later that evening we went for a run and to scout out the Wonotoro village. 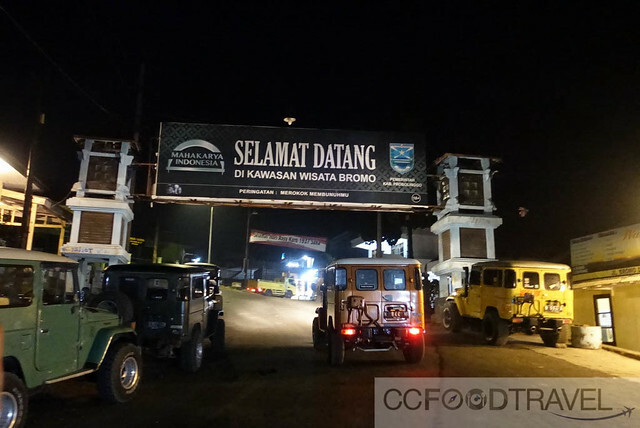 We soon realised that just around the corner from our lodging was the gateway and starting point for Bromo National Park. 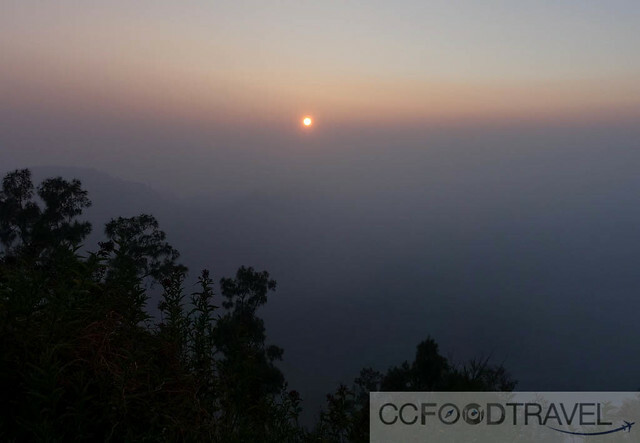 We were now at approximately 2000m altitude and there was a significant temperature drop and thinning in air – I felt myself breathing harder even with a simple jog of an hour around the area. Be sure to pack a wind breaker and sweater as 10-15 degrees with breeze is nothing to scoff at. 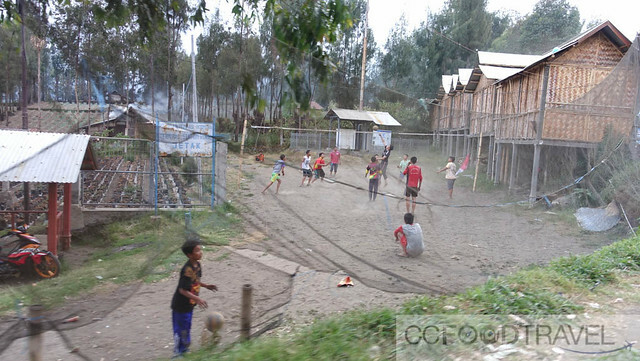 The village is easily explored on foot, and is a must see if you want to experience how rural mountain dwellers live, with an amazing vista and different farming techniques. Night cap.. and then early to bed.. as we would have a massive day head of us! Early the next morning, and by early, I mean it was the ungodly hour of 2.30am, when we got the morning call. We needed to leave the lodge by 3am to catch the sunrise over Mt Bromo from Penanjakan. I stepped out into the morning chill and was thankful for my wind breaker which gave some reprieve from the cold. (Tip: a windbreaker and a sweater underneath will do – once the sunrises, you may just as quickly shed your layers because it will get hot). 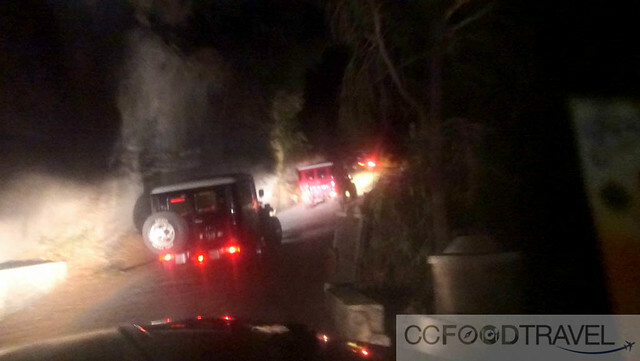 Just outside of our lodge, several vintage Toyota Land Cruisers and Jeep Wranglers we already waiting for our group. These 4 wheel drive rides cost around USD40-45 per ride, which can be shared comfortably by a party of 4 – 5 persons. There are two best places for viewing of the sunrise over Mt. Bromo – Penanjakan 1 viewpoint and Penanjakan 2 viewpoint. We were headed for Penanjakan 1. 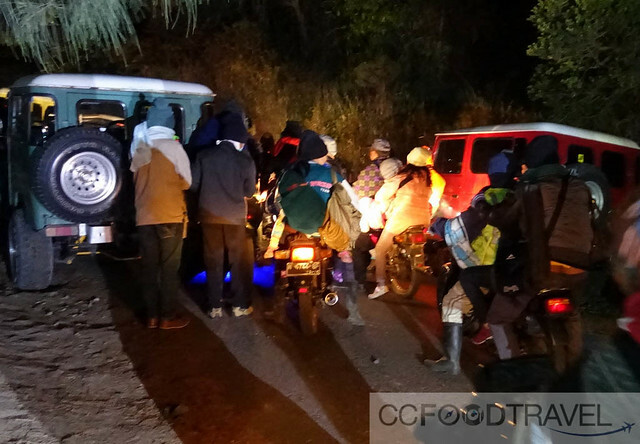 After around 30 minutes of a bumpy jeep ride, twisting and turning in the dark, over sandy pothole ridden roads, our convoy of offroad cars reached a parking area, and a point where we could ride no further. You see, it’s really hard to explain but picture if you will, hundred of folks on foot, and about as many motorcycles zipping by. Add jeeps to the mix and it’s the perfect formula for epic, noisy and dusty congestion. I mean, I was actually happy to get off and go on foot, up the hill for the rest of the way, up to Mount Penanjakan (2,770 meters). It was surrealistic to say the least – I told hubby I felt like a teenager going to an outdoor rave at some remote mountain venue – the atmosphere was electric.. part anticipation of the sunrise, and part being scared s***less that I would get run over by man, bike or jeep. There were many close shaves I tell you, but we survived. Anyway, this harrowing, albeit fun hike up to the lookout point took roughly a further 20 minutes. 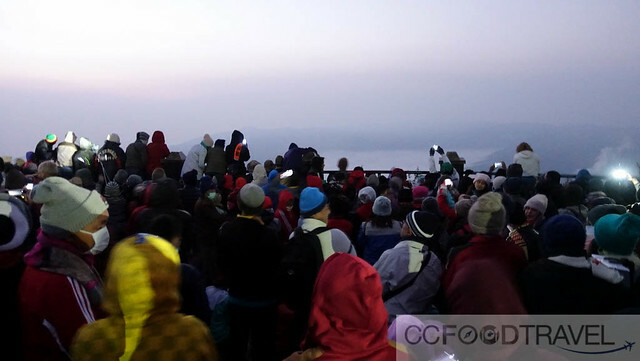 By 4:30 AM, a crowd of several hundred tourists and their guides had arrived for sunrise. 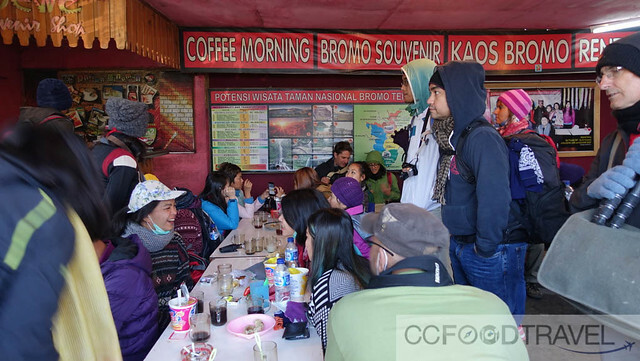 Coffee, tea, and snacks were being sold by the members of the indigenous Tengger community at cafes that lined the streetside. We had a quick hot ginger tea to warm us up, then it was time to go to Penanjakan 1 viewpoint for sunrise. The first signs of sunlight began to appear behind a whole sea of human heads and arms wielding cameras, innumerable selfie sticks and mounted goldpros. Soon a crimson line formed over the horizontal band of clouds hovering on the horizon. An hour later, at around 5.30 AM, we were supposed to catch the most spectacular sunrises on earth. Unfortunately this was marred by hazy weather, and we didn’t actually see much. 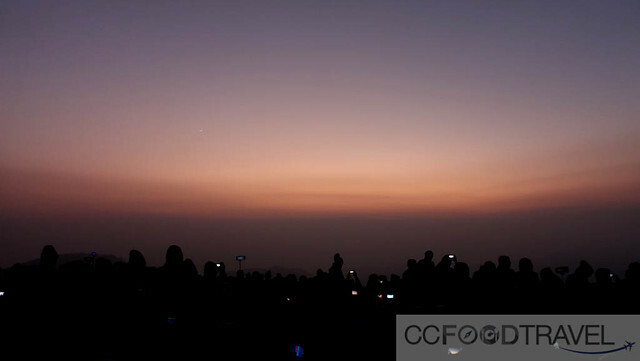 The sun was supposed to cast a warm golden glow over Mount Bromo, but it was not meant to be. Oh well, no matter – it turned out that later, we would catch a superb view anyway, as we headed towards our next adventure that lay across a sea of sand and ash. 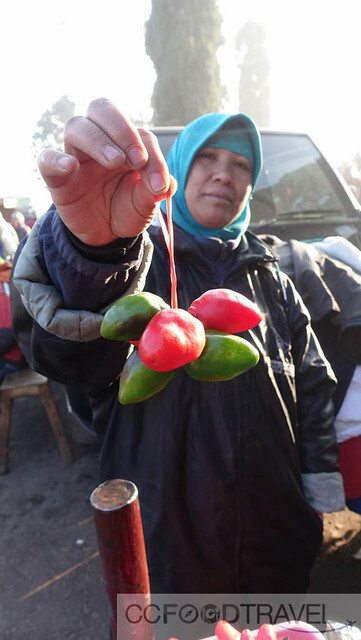 After the sunrise, we were met by our guides and had some time to have instant hot noodles and drinks, shop around at the roadside souvenir shops of the Tengger folk, before being given surgical masks to protect us the dust and ash that would come, as we hiked up Mount Bromo. warming up with food and drinks before our next adventure.. Plenty of time to check out vendors and their souvenirs .. some of us found it colder than others! We got back into our jeeps and raced down the hill, and headed towards the Tengger Caldera, where Mt Bromo sat majestically in the sunlight. 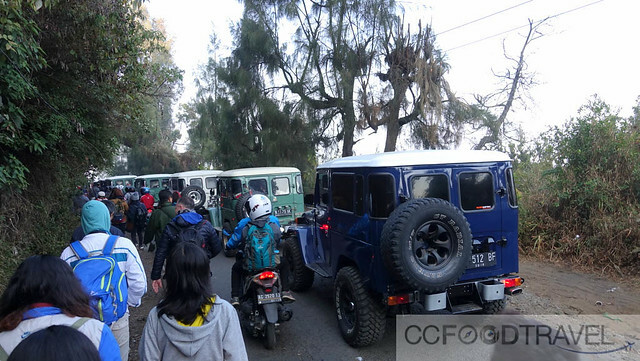 And as luck would have it, the skies cleared and we had sunny weather, so our jeeps stopped us at a look out point, for a photo moment of the magnificent Bromo. Stunning Mt. Bromo came out to play, in the sunlight! Onward to Bromo on the Morning Star! Down at Tengger Caldera, it was another surrealistic moment. I felt like I was on the moon – we were driving across one big crater racing with other trucks, superbikes, and dirtbikes, stirring up massive sandstorms on the dusty soil, some even jump off little sand dunes. OK, a lot like Mad Max! 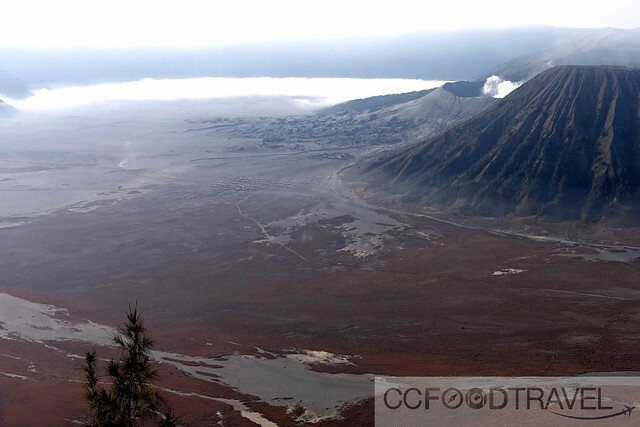 The massive Tengger caldera is 10KM wide, with 5 peaks rising ominously from the ground, Mount Bromo included. 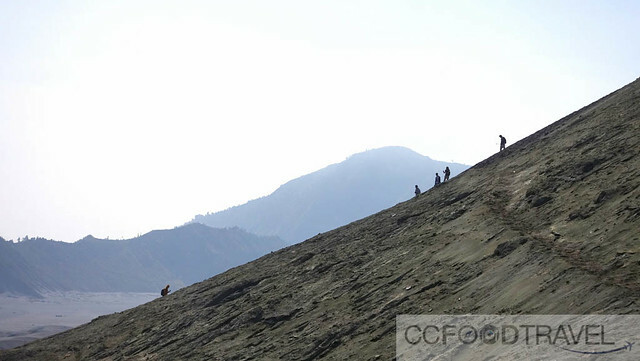 The five volcanoes within the caldera are surrounded by a vast area of sand called the Tengger Sand Sea, which in turn is surrounded by a steep crater wall of the larger Tengger Caldera with height differences of about 200–600 meters. 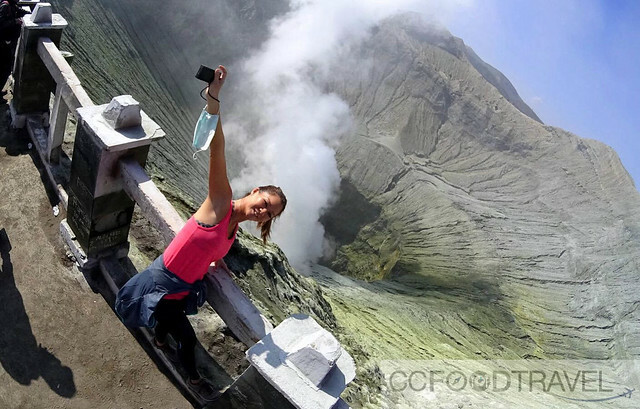 There are five volcanoes are, Mount Bromo (at 2,329 meters), Mount Batok (2,470 meters), Mount Kursi (2,581 meters), Mount Watangan (2,661 meters), and Mount Widodaren (2,650 meters). This stunning and sci-fi like landscape was one of the most amazing I’d seen on this trip. Our jeeps drive us as close as possible to across the sea of sand and park at a designated spot. 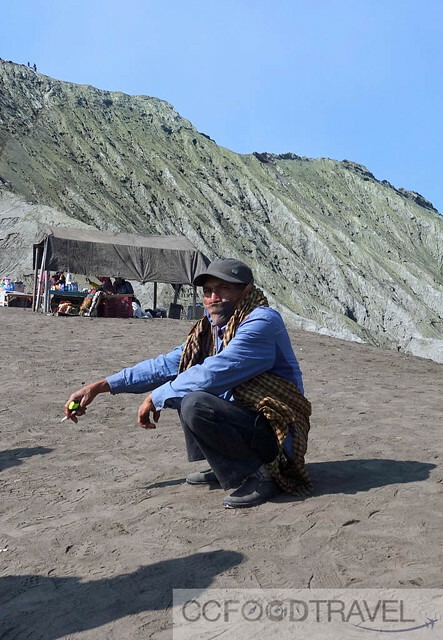 Then there was the matter of an adrenaline-rushing horse-back ride towards the foot of Bromo, and finally a hike to the crater rim itself. Ok, well some of us trotted while others galloped of course. 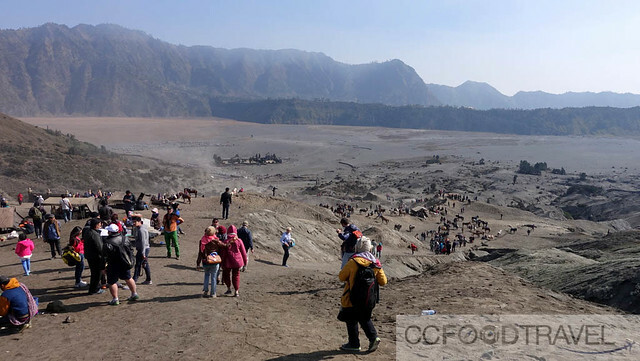 By far the most popular reason people come to the Bromo-Tengger-Semeru National Park is to hike the collapsed yet still intensely smouldering Mount Bromo. @tummyleejones aka. Cumi, galloping across the Caldera.. like a pro! Thanks @marischkaprue for this rocking photo! Actually, it is a rather wonderful walk up to the crater, if you don’t mind sand in your shoes (and almost every unprotected orifice) but in case you don’t want to walk, there are the horseback rides. A round-trip on horseback costs 100,000 IDR (RM30/USD8). Pura Luhur Poten Hindu temple as seen from our ascent point on Bromo.. 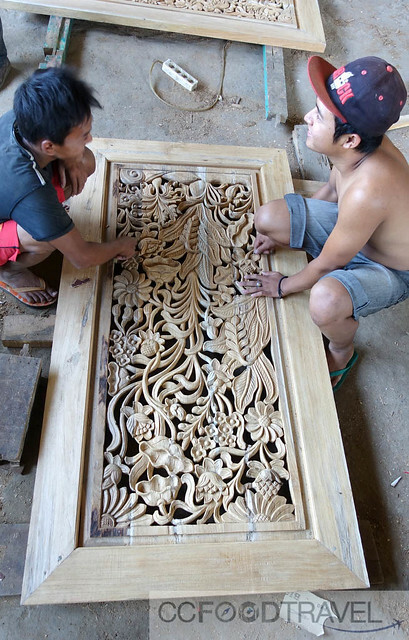 While the Javanese are predominantly Muslim, the Tengger practice Hinduism. 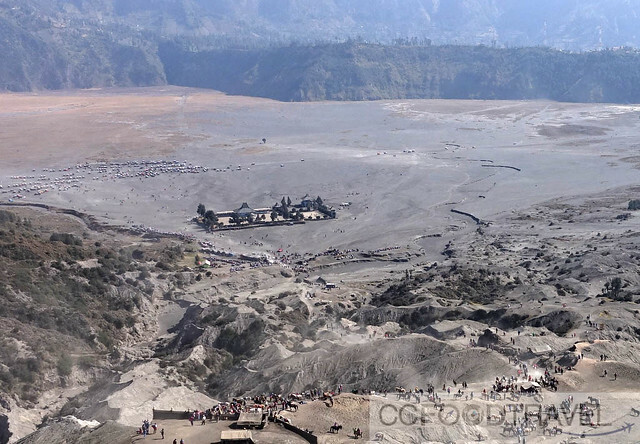 The eerie structure of Pura Luhur Poten Hindu temple as seen from Mt Bromo. Apparently the Tengger Hindu community still holds an annual event called ‘Yadnya Kasada.’ The ritual starts with dance performances in Ngadisari village. 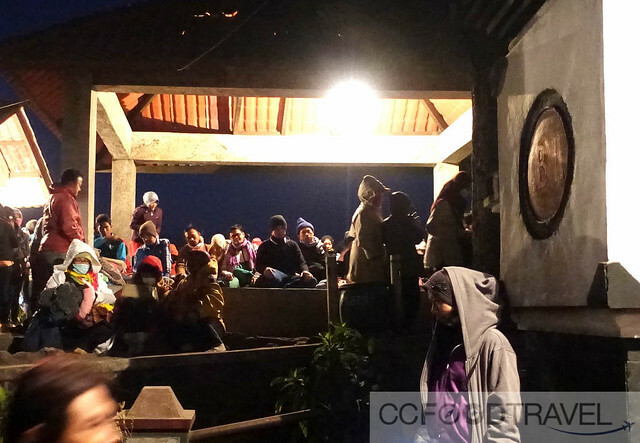 Before midnight, dozens of shamans gather in the Luhur Poten Shrine to bless the offerings. 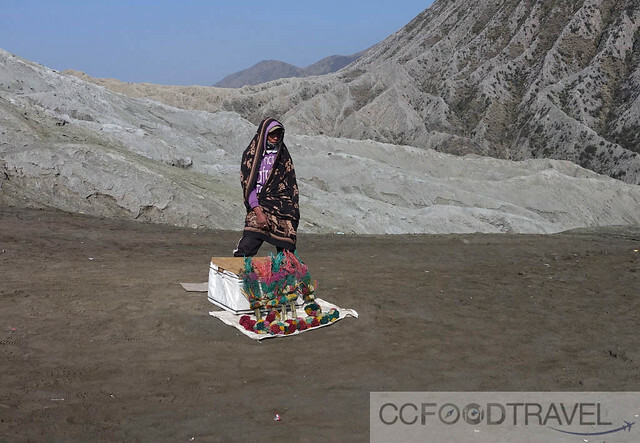 Later, the Tenggerese flock to the top of Mount Bromo and throw those offerings into the crater and pray for prosperity and safety. ‘Leave no man behind’ – this looked like the more dangerous route up Mt. Bromo – no banister to prevent you from slipping.. Some daredevils would even go to the unprotected part of the crater rim for a photo moment – it made my knees weak and I had to look away..
Wow.. What a spectacular day! 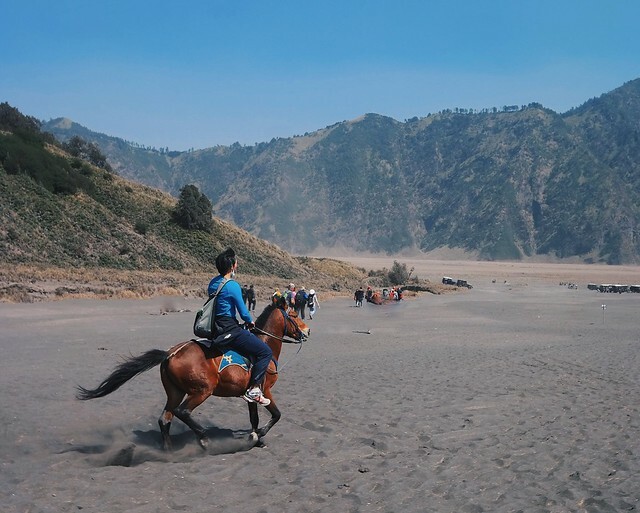 Mount Bromo definitely offers an ash desert, off-road jeeping, horse riding adventure, and some of the most spectacular scenery in Indonesia. We won’t soon forget this epic day out! We didn’t have time to do this, but apparently on the other side of Bromo is a green landscape, unlike the sea of sand in Tengger Caldera. Too bad we missed this. Located across the Sea of Sand on the southern side of the mountain, this is definitely the option I will pick if I come back to Bromo in the near foreseeable future. This is supposed to be a rather glorious spot for a picnic and this is something we missed doing unfortunately. Maybe some might find this temple eerie and a bit to desolate, but it’s a glimpse into the Tenggerese Hindu belief and rituals. The Poten can actually be seen as you climb up Mt. Bromo – at first I did not realise it but later I noticed I was actually shooting the Poten. The local Tenggerese houses are incredibly colorful. Lose yourself and wander along their houses to soak up the vibe of the village We wish we had more time to immerse ourselves in their way of life and explore the back lanes more. 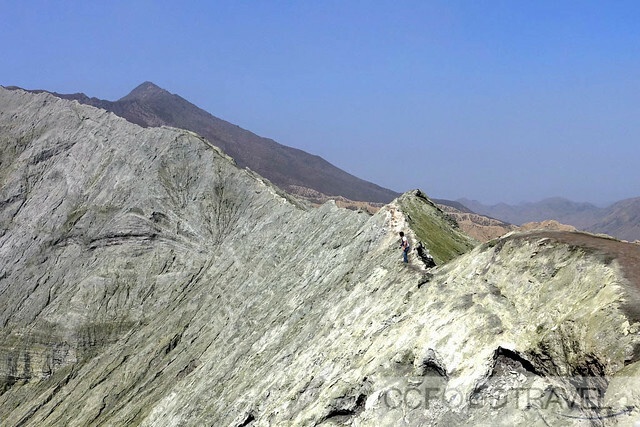 Mount Batok is also volcanic but no longer active and lies to the north of Mt Bromo. This is probably the one that me and hubby would have liked to go on best. 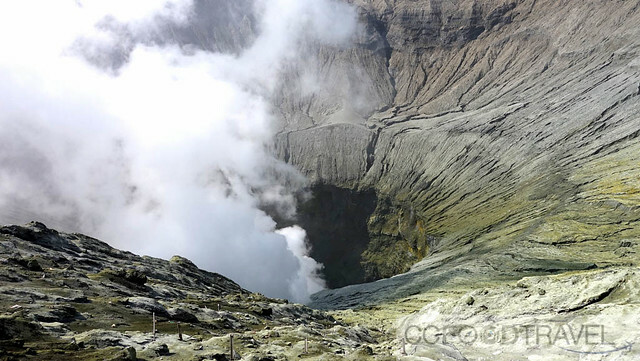 It’s the most challenging and is located at the far south end of the Bromo-Tengger-Semeru National Park. Mount Semeru is an active volcano and can be climbed over 2 days and it is advised you hire a guide to take you at least part of the way. 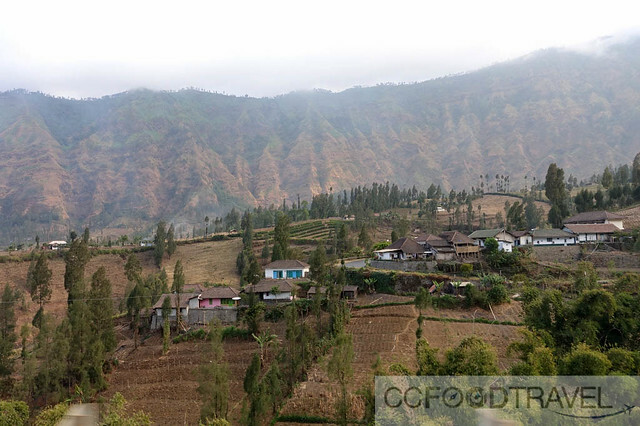 Wow, what an amazing challenge – yes we definitely need to revisit Bromo.. and soon! Too bad you missed the main attraction – the spectacular sunrise. Darn haze! It doesn’t look like it is ever going to end. I know right..?! Well these things are just out of our control… God’s plan! LOL.. anyway, it was still amazing once the clouds cleared! and oh.. what an adventure! Thank u Linda.. very kind! 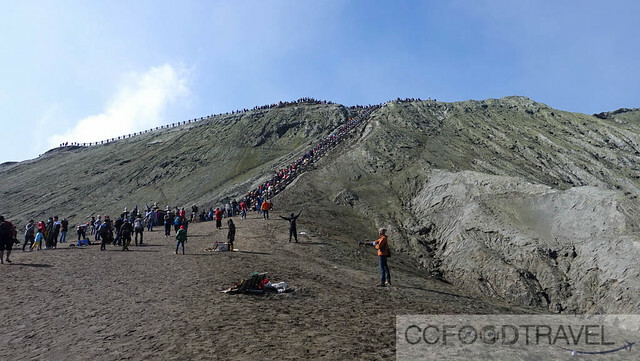 Hope u can visit Bromo one day.. it’s awesome. haha.. it wasn’t THAT cold laa.. i found it mild! but yes.. it got more fun, once the day warmed up! Which just goes to show.. u can never predict the weather. It changes from day to day – always a surprise! 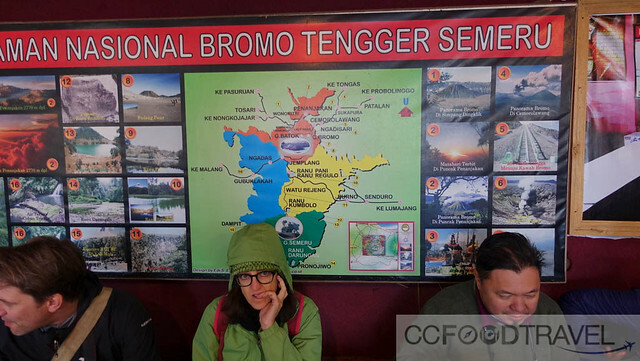 unfortunately, now bromo closed because the erupting.